Today marks the 12 year anniversary of the horrific terrorist attacks that forever changed our country and our people. What we witnessed that bright, sunny morning in NYC, Washington DC, and in a field in Shanksville, Pennsylvania seems unbelievabe, even now. 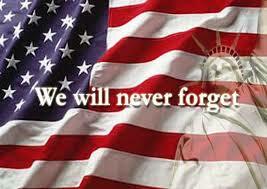 Though our emotional wounds have scarred over a bit, as tends to happen as the years go by, we will never forget. Not those who lost their lives. Not those left behind to grieve. While the attacks themselves came as a nightmarish surprise, our response as Americans did not. We did as we have always done: We took care of our own. And on this 12th Anniversary, I’m sure we are all, as always, Proud To Be Americans. In honor of all the fallen and all who have carried on, here is Lee Greenwood’s classic song.